Classic evergreen design is yours with the English Boxwood. This is the perfect plant for lining pathways and edging flower beds, to bring an old-world charm to any garden. 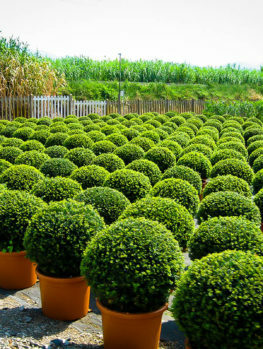 It is also ideal for clipping into balls and other small shapes for container planting, alone, or with annual flowers. Left unclipped it develops into an attractive mounding evergreen shrub three feet or more tall that brings structure and form to plantings around your house or in beds. 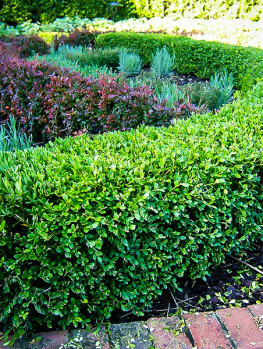 Especially resistant to insects, English Boxwood is the ideal choice for easy gardening. Slower growth means less clipping and pruning is needed and its soft, glossy foliage is attractive in all seasons. As well as classic formal gardens, this plant is being used in modern gardens for informal groupings to great effect. 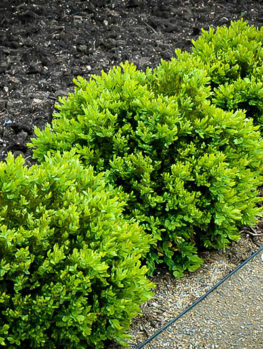 The English Boxwood is the perfect evergreen to plant as a border or hedge in the garden. This 2 to 4 foot tall shrub is ideal for creating lines or pathways in the garden, and it works well as an accent for larger, colorful ornamentals. You will need to put in little effort in order to sculpt the picturesque boxwood, with some minor pruning, mulching, and fertilizing making up the only real requirements. Once established, your English Boxwood is drought resistant, and it also grows well in full sun or partial shade. Landscapers love the English Boxwood, whose low maintenance makes it perfect to plant in rows to create well-formed boundaries and corners. 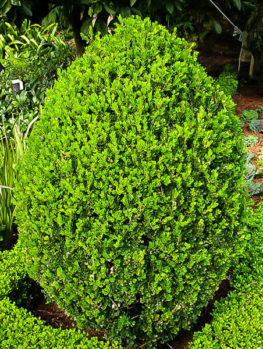 The English Boxwood does not get too tall, and will only grow between 1 and 2 inches per year. Its slow growth rate, however, is actually a benefit; it will allow you to prune, shape, and maintain size with ease. Since English Boxwoods are frequently planted as barrier plants, this also helps to ensure they do not overwhelm any other accent trees or ornamentals. 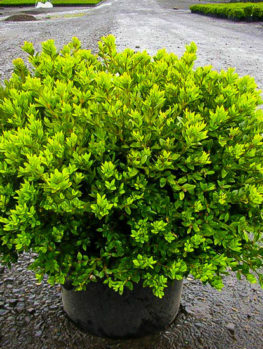 The English Boxwood is the best low-lying evergreen available! 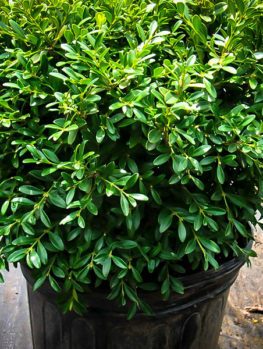 Perfectly sized between 2 and 4 feet tall and between 2 and 4 feet wide, the English Boxwood is typically planted as a short wall in the garden. Some landscapers choose to cultivate small barriers or boundaries to help mark pathways or growing spaces. 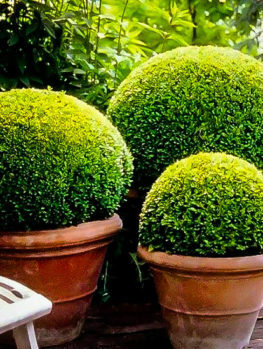 Many landscapers also use the English Boxwood as an accent. 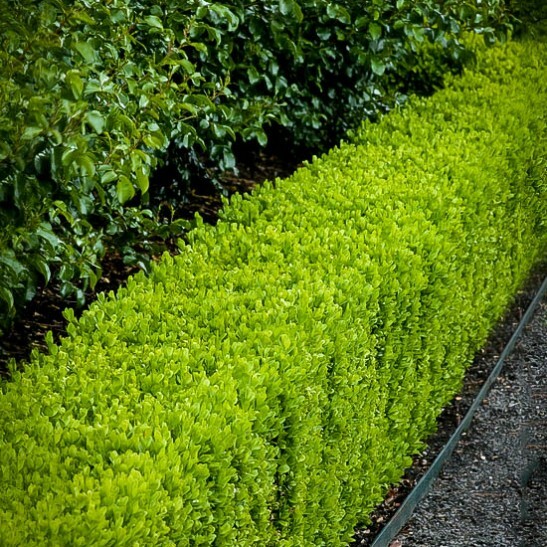 Plant a small ring around a stunning ornamental tree, or plant several boxwoods in corners of a garden wall. These evergreens are easy to prune and maintain their rounded shape well, making them perfect as accents or breaks in an otherwise monotonous garden scene. But the English Boxwood is not just a sidekick in the garden community – you can choose to plant one in a container and center the shrub on a pedestal or staircase. This evergreen can look stunning on its own, especially when framing a doorway or incline. Easy maintenance is the other calling card of this popular plant. The English Boxwood is adaptable. Soil conditions can vary dramatically and this evergreen does not mind. Once you’ve established the English Boxwood, it can even sustain moderate droughts. English Boxwoods grow well in USDA Hardiness Zones 5-8. They prefer well-drained soil but will adapt easily to less ideal soil conditions. Pests are also not a concern – whereas most low-lying shrubs are picked clean by deer, the English Boxwood does not interest deer or other pests. Simply use mulch and fertilizer once a year and prune or thin the English Boxwood down 10% once a year to promote healthier growth and better air flow. Using mulch will also help to move this process forward. When it comes to planting your English Boxwood, find a suitable location by looking for places on your property with full sun or partial shade, and decide if your English Boxwood is going to be a border, an accent, or the focal point. This will likely help you find the best spot. Once you’ve determined a location, it is time to dig a hole. The hole should be twice as wide as the English Boxwood’s root ball and only just as deep as its height. The tree will settle over time so the depth is not as important. Once the hole has been dug, hold the tree vertically in the hole, preferably with a partner. Next, backfill the hole with soil and water. If using mulch, apply a 3-inch layer in a 3-foot radius around the base of the shrub now. If you are planting the English Boxwood as a border hedge, simply plant each specimen in holes between 1 and 2 feet apart, creating a row of English Boxwoods. The adaptable and easy-to-maintain English Boxwood does not have too many special requirements. The one item to keep in mind is pruning. 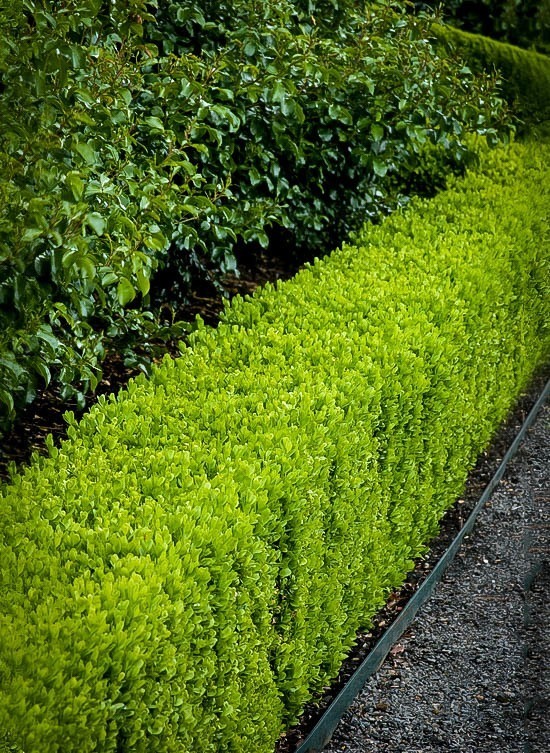 Proper thinning of the boxwood is essential to its success. Prune up to 10% of the large exterior stems, making the new growth in the interior of the shrub visible. Allowing older and newer leaves to co-mingle will introduce more oxygen into the plant, enabling more successful growth. Please be careful! Not all English Boxwoods are the same! 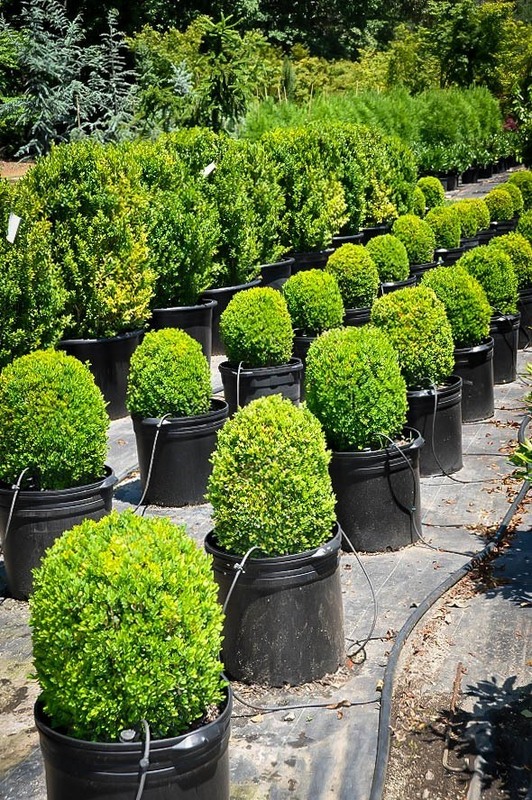 Oftentimes, so-called nurseries will seek to cut costs by selling bare-rooted or branch cut boxwoods. These same nurseries will sometimes replace the spectacular English Boxwood with a poor performing variety. These replacements will lack the very qualities that make the English Boxwood great. Here at The Tree Center, we ensure that proper care is given to your English Boxwood during its initial stages of growth. Early cultivation is exceptionally important to the later growth of your plant. The highly trained staff at The Tree Center provide the expert care and love that only true arborists provide. This paired with your proper planting and daily care can help ensure the success of your English Boxwood in seasons to come. 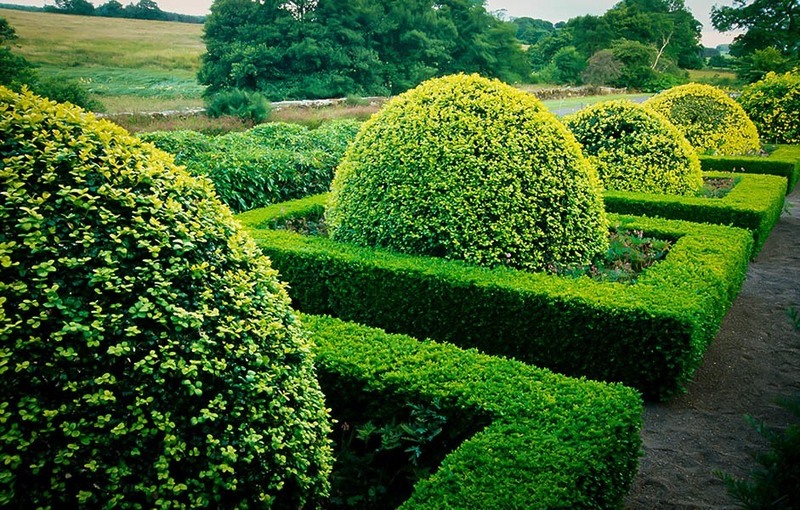 A wide variety of English Boxwoods are available to you – but hurry and act now! The Tree Center’s stock is always changing and the popular English Boxwood is limited. Order yours today to ensure your garden will be wonderfully accented this season.